I created these images, and put them together to represent one theme. I asked each model to tell me their favorite and least favorite physical feature. I then photographed these features and stacked them on top of each other to create one final image. I was very inspired by the portrait photographers that we learned about in my first semester and really wanted to give it a go. I used to be a sociology major, so I was interested in the sociological stand point I could get from photographing these students. I wanted these students to see the photographs I took and see that their “worst” feature could be beautiful as well as their “best” feature. I put these images as high contrast and black & white because I feel like it captured the right emotions for the theme I was going for. I wanted the features to almost be abstracted because I think that is the best way to see uniqueness and beauty in something. This particular set is of my best friend. He has struggled with body image and “fitting in” his whole life. When I thought of doing this project, I immediately thought of him. I thought that maybe I could help out, even in a small way. When I asked him what his best feature was, he had a hard time coming up with one; especially one that was unique and interesting to photograph. (His words, not mine). I eventually had to help him come up with a few ideas, all of which I photographed. 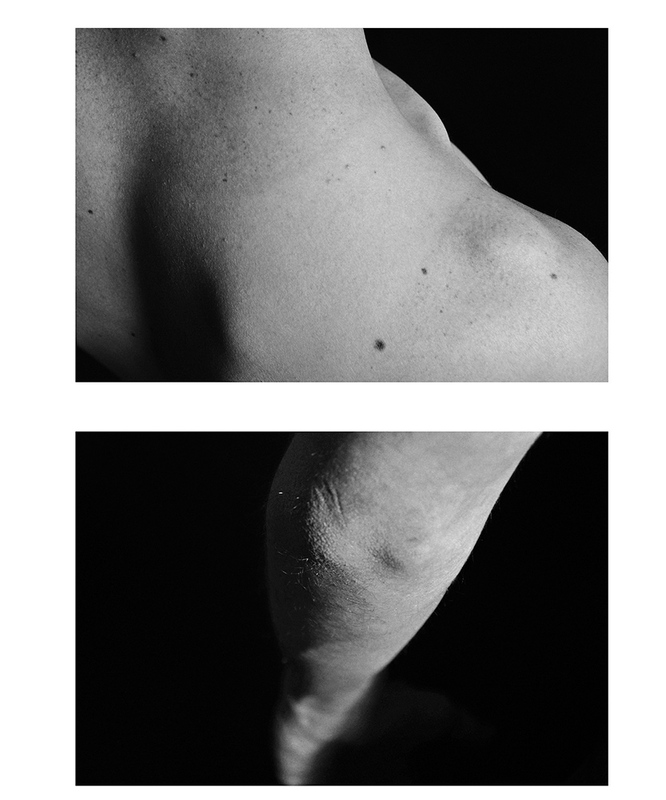 I ended up showing him all the images, and he chose the one depicted here; his shoulders. I did mention the tan line to him, and he said that it reminded him of the fun he had over the summer, so I should leave it in there (even though it was the next spring, and the tan line had not yet faded). After settling on the best features image, we brainstormed the feature that he was most self-conscious of. I was surprised when the first thing he said was that he disliked his elbows the most. I had known him for a long time and known that he was self-conscious about many things, and he never mentioned his elbows before. I decided to only photograph this feature because it was something that surprised me and I had never photographed that part of the body before. In the end, he was very happy with the images, and I think I even may have helped him improve his self-esteem, even if it was just a little bit. To shoot this, I used a Nikon D5000 DSLR camera with an 18-55mm lens. I used a black backdrop in the studio, with one hot light to create a strong side light. To illuminate the unlit side, I had a friend hold a white piece of cardboard as a reflector. I used 200 ISO, f/5.6, and a shutter speed of 1/250. My name is Emily Larsen and I am a sophomore at Northern Arizona University studying a major in Visual Communications and a minor in Photography. I attended East Valley Institute of Technology in Mesa, AZ where I earned my cosmetology license and high school diploma at the same time. One day, I plan on doing hair and makeup fulltime, and designing and photographing my own work. I prefer to shoot detail and portrait photography, mostly in the artistic setting. I like to work with people and use creative light and techniques, like HDR, in my photography. I am inspired by macro and black and white photographers, and hope to one day be featured in a fashion/beauty magazine.